Here is what some of our volunteers or students say about their stay with us. Libby from California - My time at Sahainan was an absolute dream. It is so rare to find people who love their ideals, yet everyday Sandot and Shen live in harmony with their beautiful farm. I learned everyday about the theory and application of permaculture, and tried to get Shen to share the secret to her delicious food! Thankyou thankyou Sandot and Shen for sharing the spirit and beauty of permaculture! I really enjoy my time in Sahainan! Pablo and Javi from Chile - We spent almost 20 days at Sahainan farm, including the 10 days of practical permaculture course.. it was a great experience, far beyond our expectations! We just loved the way Shen and Sandot live and share they knowledge. They are very enthusiastic about permaculture and it is really motivating to see how they apply every principle in their life. The course was very interesting for us, it was a mix of theory and practice in the field or at the village's school, sharing with the local kids. After the course, we helped them cooking (their food was delicious), planting rice and fruit trees, feeding the chickens, building with bamboo and collecting plants and fruits for our meals. It is amazing to experience this style of life, gathering your food from the forest, cooking in fire, eating all together as a family and then going to sleep to our bamboo hut, with all the nature and forest sounds around us. We really recommend to visit them, we believe is the perfect place to learn how to be connected with nature the way Thai traditional people do. Kop khun kha!!!! Hope to meet you again! Andrew from Australia - Have you ever dreamed of a simpler life? Of a life more connected, not to the world wide web, but to the natural world and everything that lives in it? A visit to Sahainan can be a huge eye-opener in the best way possible. Shen, Sandot and little Jon Jon live an idealistic life that is unique, inspiring and sometimes downright challenging for the uninitiated! I came for a week, stayed a month, and only scratched the surface of the knowledge and wisdom Sandot and Shen have to share. I highly recommend doing the 10 day Practical Permaculture Course to maximize the learning experience and then consider staying on afterwards. Come with an open mind, open heart and a bit of old world patience and grace, and you will see the world in a whole new way. From my own experience, being a pastry chef, helping Shen in the kitchen rocked my world. Making steamed breads and sweet pies without measuring any ingredients just felt wrong! With time, I let go and embraced the more intuitive and natural flow of jungle cooking with a firewood stove. The subtle art of "making do", of "less is more" takes a great deal of reconditioning and rewiring of the deeply engrained modern Western ideals of excess and wealth. A few years ago, I heard of a mysterious and benevolent bamboo master who lived in the jungle of northern Thailand. He taught locals and foreigners alike how to live and farm organically like his ancestors did in simpler times. His classrooms and houses were simple open air huts, made of bamboo and local hardwoods, built by his own hands with scarcely more than a machete. I'm happy to say that the legends are true! Sandot is indeed a master of natural building and wild food foraging with a heart of gold and yes just a little bit crazy. The kind of crazy that makes one leave a good paying job as a cog in the Capitalist soul-crushing machine, to live a purposeful and fulfilling life in a quiet mountain village. Think of Sandot as the Mr Miyagi of permaculture, who lives it more than he preaches it, and you will learn much as you share their home and lives with them. Thanks for the invaluable memories Sandot, Shen and Jon Jon! I hope to visit you again soon. Yuki and his family from Japan - Four years ago, my friend took us to Tacomepai, Sandot s previous farm. People who stay there really enjoying their life even using less energy. By looking at the life style they have in the farm, I think Sandot can save the earth from the world energy problem. My first visit there was only two hours, but it had totally changed my life. I start thinking to live like them after my first visit. Two years ago, I finally got the chance to stay at Sahainan Permaculture Organic Farm. The daily life was very excited. Sandot taught us various DIY techniques. Every time after learning some techniques, I became more free from money. I do it by myself, i get more freedom from the money system. I can now live calmly with the nature. And, the practical permaculture course here is also very good. We learn not only theory, but also a lot of hands on practices. And on the last day of the course, we made presentation of our future permacultural life. I still keep the presentation paper until now, and sometimes looking at it. After I left Sahainan and came back to Japan, I started my new job. The job is running a "Permaculture Laboratory". I am now able to live a more permaculture life and teach about permaculture. Marianne from USA - At the end of February into mid March 2017, I stayed at Sahainan Permaculture Organic Farm. It was a wonderful experience for me. Sandot and Shen were wonderful hosts. They were very responsive when I was emailing with them about coming. When I showed up in town Sandot was there to pick me up. I was showed my cute little hut when I got there that had a mattress, blankets, a pillow and a mosquito net. The food at the farm was amazing. It was healthy and delicious. Shen even made us snacks and kombucha. I took the permaculture course and learned so much. There were even days we visited the local school and played games with the children. We even harvest riverweed and went into town on Saturdays to the night market. It felt like a home away from home and someday I wish to go back. Wright from Toronto, Canada - The Permaculture Design Course (PDC) at Sahainan is unlike any other that I've heard of. It not only covers the theoretical aspects of permaculture (which so many PDCs restrict themselves to), it immersed me in a hands-on application of those very principles. It really helped me to more deeply understand the principles of permaculture by seeing them put into practice at Sahainan. Some of the practical activities I did during this course include: making my own biochar (including building our own biochar stove); designing/constructing a permaculture garden; maintaining a stock of Effective Microorganisms (and all of their amazing applications); selecting and harvesting bamboo (for use in construction, making utensils, etc. ); building a chicken coop; the list goes on! Sandot and Shen not only offer an outstanding and incredibly affordably-priced PDC, they also offer a unique opportunity to go out of the classroom and truly LIVE permaculture. Through my immersion in Sahainan Permaculture Organic Farm and through my having taken their PDC, I have come out with a deeper appreciation for both permaculture and for this amazing couple who have dedicated their life to living in harmony with its principles. They are an inspiration to us all, and I am so very grateful for having had the distinct privilege of benefiting from their PDC - and from their company. I will forever remember my time there, and I have every intention of returning. I recommend anyone who wishes to experience organic and/or permaculture farming to spend time at Sahainan - it is an experience like no other. And I recommend their PDC to anyone wishing to more deeply engage in the principles, learnings, and practices of permaculture. Stefani from Toronto, Canada - Wes & I just finished an incredible ten days completely off-grid in the northern jungles of Thailand at Sahainan Permaculture Centre...ten days with no electricity, living (almost) completely self-sustainably off the land in community with some of the most incredible people. This was a truly eye-opening experience for us Western folk who are used to having pretty much everything we could ask for at our fingertips and has really led us to question how much we really need...this has been one of the very best experiences I have ever had... I truly encourage every one to go back to nature and experience life as it should be! Jeanne from France - This last July 2017, I have been in Sahainan in order to film the making of a hand charcoal water filter. I was commissioned by a French NGO dedicated to gather documentation about this kind of self made technologies that answer the basic needs of households or local communities in a sustainable way. We were supposed to install the filter in the school of the village which, with the help of the « souls » of Sahainan, Sandot and his companion Shen, has become widely dedicated to the teaching of permaculture. Located on the Nan River, this is the « last » village » before the unhabited forest that stretched to the Laos border. I thought I would come only for the purpose of filming the water filter. But, at thevery moment I stepped in my wooden hut elevated above the forest, and then, barefoot in the ground sowing rice surrounded by wild forest, I was overwhelmed by he peculiar spirit of the place : a sense of being across the world that is more and more difficult to meet, and a serious but soothing labor going on. Each day, if I opened my eyes and ears, I could learn a million things about nature and the living in harmony with her, tricks to do it, the efficiency needed, ever recycling and reusing things, a school of life I would have preferred to have been since a younger age. Before coming, I frankly knew nothing about permaculture, and I must say I still not theoretically because I hadn’t the time to follow the monthly class going on there. But in only one week, I can say I acquire a deep sense or intuition of what it would be, only by giving the little help I could, and observing. I found it deeply reassuring and simple, as things actually should be and work according to natural laws. Anywhere he was, Sandot couldn’t help but use his machete to transform the abundant bamboo of Sahainan within reach in a million kinds of tools and materials. Magician-like, he could made chopstick, pliers, stair ramp, doors, and manifold links and bamboo « elastics » whenever he needed to tie something. With coconut matting, he designed in no more than 2 secs a brush to spread ciment. I guess that before using a machete like that, you need a life long training… But the material was just at hand and he made the best out of it. Not only Sahainan is the world of ancestral wisdoms but also of great inventiveness and day to day experimentation. The highlight of the show and a great group shared experience was the making of the water filter with the school children, the volunteers, and the « students » come from all over the world to follow Sahainan permaculture classes. With everybody good will and energy, we cleaned and piled the various layers of stones, ashes, gravel and charcoal that would allow us to drink a wonderfully mineral tasted water coming straight from the spring nearby. That was the occasion, too, to share sticky rice and delicious stews from Shen in the majestic adobe classroom of the village. That was a great time. For all these knowledges generously given, the simple and happy life I experimented in Sahainan that I am already so nostalgic, I would like to thank Shen and Sandot and can only encourage the curious, sustainibility and nature interested people of the world to leave their bags here for a little while, open wide ears and eyes, and learn from the last people who know how to live and persevere in their dreams ! Tom Imrie and family - We are a family of 4 that have been travelling for the past 18 months. One of our greatest highlights so far have been our time that we spent 1 month in Sahai nan. Their farm is situated in the most idillic position surrounded by natural beauty as well as natural resources. Living off and working the land gave us a great connection to our surroundings that I am sure will continue to guide us for our future living. Our accommodation was a simple bamboo structure yet was perfect for our needs. Sandot and Shen were wonderful hosts. Sandot is willing to share his knowledge to anyone who shows interest. Shen is an unbelievable cook. The variety of food that comes out of her very humble kitchen is remarkable and again shows how simple life does not mean ordinary. Our 2 children aged 7 and 9 were given freedom to explore as well as learn as much as they wanted. Tilling the land, planting seeds, chasing chickens from the newly planted seeds, helping with food preparation, (Thank you Shen for all those "cooking lessons" with Emma) playing with Shens and Sandots son John, where some of the things they enjoyed to do. Apart from everything I have already mentioned we also met some wonderful travelers from all over the world. If you want a chance to get in touch with natural living and meet amazing people this is the place to go. Caroline Bruno, Hawaii - When I chose to spend a month at Sahainan Permaculture Farm, I was seeking rejuvenation and inspiration to bring home with me. My month at Sahainan wasn't just an education in permaculture or sustainable building. It was an education in living well. While working and eating and living alongside Shen and Sandot's family, I felt fulfilled by everyday joys and the small beauties of life at Sahainan. I worked as a volunteer and took the Permaculture Course and I would highly recommend trying both. Each are an opportunity to truly learn, not just be taught. This means that inquiries about everything are encouraged and you will be able to focus on what you have always wanted to know. Tailor your time at Sahainan for what you need most. Is it disconnecting from everyday stressors, is it learning delicious healthy recipes for your kitchen at home, is it how to plan a whole permaculture farm, is it starting and maintaining a consistent yoga and meditation practice, is it getting your hands familiar with the skills and tools needed for bamboo building, is it understanding how to create simple machines to make life easier using only natural or recycled materials? You can get exactly what you need especially when you open yourself up to learn during every part of the day. You will not only be rewarded with unending new information (and perhaps some of Sandot's genius, but wacky inventions), you will also be taught using a style that empowers you and gives you tools for personal growth. Staying at Sahainan is an education for your whole body and it will make you a better student when you leave and return to what ever path of life you choose. Thank you Shen, Sandot and Jon Jon for this experience and opening up your home to me. 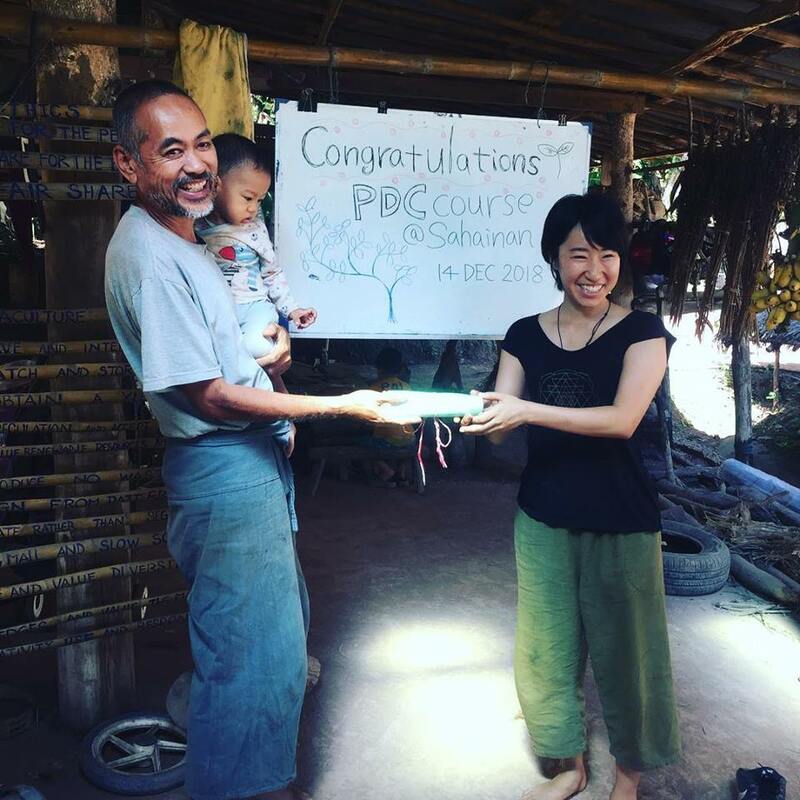 Naoko Taniguchi, Japan - I’ve been to Sahainan for PDC course in Dec, 2018. My 2 weeks stay here was an amazing experience. I was almost zero knowledge about permaculture when I came here. But Sandot and Shen has been patient and very much passionate teacher. What I liked most in this place is that you can learn phycical practice on top of the theory part. There were a lot of hands-on sessions such as plant/harvest vegitables, make a compost from buffalo poo, make a bridge from bamboo, and etc. So that I was able to experience what permaculture is. I’m so glad Sahainan is the first place for me to learn permaculture. Grace Yew, Singapore - Frankly, it was pure culture shock. The website did not share these: No electricity, Cold showers, Cooking off a fire; no instant hot water, And no meat?!? HOW IS THIS EVEN SUSTAINABLE?!? City girl goes crazy finding out what she wasn’t prepared for. BUT once the frantic dependence on the need for mindless convenience and “necessary” comforts subsided.. I found myself at ease. I can live with so much less and still be contented. Experiencing that there’s another way to do life was refreshing. You make your baskets bowls and cutleries. Your wastes go back to nature. You eat drink off the fruit of your labour. Scrap the fridge n the microwaves. Your food is fresh and enough for the day. Dirt is okay, and detergent.. what detergent? I d’ont remember how to make bio char, or compost or water filters or which crops deplete the soil of certain nutrients. I remember the challenge of a different lifestyle, I remember the smiles and laughter of those who are so generous though not necessarily “money” rich, the ingenious solutions of those who live simply by intentional choice, the big heartedness of those who really love earth and who share it with much passion. Kyle Taylor, Austrialia - A wonderful place led by a passionate couple determined to help heal and regenerate the earth and ourselves and teach others how to do so. Shen and Sandot are working tirelessly to live and teach a better way that is so crucial to our continued existience in our current times.